Andersen is proud to once again support the Northwest Idea House with 425 Magazine and JayMarc Homes. Working in partnership with Western Pacific Building Materials, our 100 Series windows are the perfect complement to this beautifully designed contemporary home defined by clean lines, sophisticated amenities and stunning architectural details. The marriage of beauty and functionality found in the Idea House design is one that homeowners across the area can replicate no matter their home’s style. The style of the Idea House windows is amplified with the choice of color, featuring dramatic black interior and exterior finishes. This sets the tone from the curb and continues to impress the quality of workmanship throughout the home. Each room was carefully thought out and designed to take in the gorgeous views of Downtown Bellevue and Whaler’s Cove that surround the home, making Andersen 100 Series the perfect choice to frame each and every vantage. Andersen 100 Series windows are made with a patented Fibrex composite material, making 100 Series windows and doors twice as strong as vinyl. Because color is added in the manufacturing process, the depth of pigment and durability mean Fibrex finishes won’t flake, peel, or weather as rapidly as vinyl. Designed for all four seasons, Andersen 100 Series windows maintain their stability and rigidity in the face of weather conditions that could cause vinyl windows to bow and rack over time. That same rigidity and stability help deliver dramatic sizes and shapes that vinyl windows cannot support. 100 Series windows also support energy efficiency goals in a home. A variety of glass options can be specified to meet energy needs in any region of the country and the sustainable materials used to make these windows help meet Energy Star requirements. The beauty, quality, and durability of Andersen 100 Series windows offer all the benefits of a window upgrade without the high costs many associate with a window upgrade. To sum it up, Andersen 100 Series is the smart alternative to vinyl. From colorful, patterned fabrics to blind automation, window coverings are the design trend you should not ignore. Choosing window coverings can be a bit confusing, especially if you have never done it before. There are a myriad of choices available to you and if you do not find the right product to meet your light control, privacy, décor and control options, you may end up with a product that looks pretty but doesn’t suit your needs. That is where a professional soft window treatment expert comes in! Holly Jacobs Designs is a local window covering, drapery, upholstery and bedding provider in the Seattle area who has been serving JayMarc clients for over 6 years. Holly Jacobs, the owner, has attended numerous advanced classes in window coverings and drapery design, staying on top of current trends and product knowledge. “By far the fastest growing trend that we are seeing in window coverings is home automation. Many buyers do not want to spend 30 to 40 minutes a day raising and lowering their shades – particularly if they have many windows”, says Jacobs. One of Jacob’s favorite automation product is “Hunter Douglas’ PowerView“. It is a new wireless motorization system that allows homeowners to control all of their window coverings from their smartphone, tablet or a remote. Its best feature is the ability to automatically move shades according to scenes that the homeowner sets in the PowerView app. You can control your shades while you are away from home! Bonus: Because all of the shades are battery operated, any home can be fitted with PowerView shades. JayMarc Homeowner using Hunter Douglas. The Holly Jacobs Designs team has been collaborating with JayMarc homeowners for years, also making them a veteran in the new home construction realm. 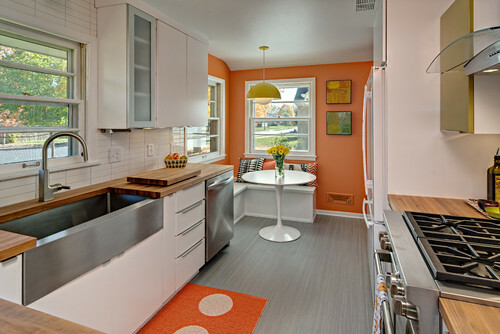 “Many JayMarc homes have many large, open windows that let in the beautiful PNW light. JayMarc homeowners want to take full advantage of these windows, letting the outdoors in so they can maximize the natural light and enjoy their views without giving up privacy and needed sun protection. We can accomplish this through careful selection and added features”, says Jacobs. Most popular with JayMarc buyers is “Hunter Douglas’ Duette Honeycomb Shade”. It comes in a variety of opacities, a beautiful color palette, child safe cord control options for a clean, uncluttered appearance and features such as top-down/bottom-up for maximum privacy without feeling closed in. Also, the trusted brands don’t just stop at Hunter Douglas. Graber, Norman and more offer wonderful selections for your home. Working with a professional will provide you the opportunity to explore and discover options that are most effective for your family, budget and personal style. Holly Jacobs Designs has been providing window coverings in the Seattle market for over 18 years. They pride themselves on their ability to provide a thorough education on available selections and will make sure clients receive not only an excellent product but excellent customer service. If you’re looking for the perfect home, you can always test your luck with the Bellevue real estate market, or consider the JayMarc custom home alternative. Choosing a new and custom home builder allows your dream home to come to you with some major advantages over buying older and existing homes. The majority of homes currently on the market are previously-owned which often come with time-consuming challenges such as repair, maintenance, and remodeling. Given these considerations, a new home may provide a more fulfilling home buying experience. Newly-constructed homes offer personalization and low-maintenance can make a significant difference in free time, energy bills and overall quality of life. Sometimes new can mean recently made homes that have already seen a previous owner, but newly built homes made for the first time can be customized to fit your family. Buying a new home is a big investment — just like buying a car, you wouldn’t want to buy a two-seater for a family of four, so consider working with JayMarc to build a custom home personalized to fit your family. Many new home builders offer personalization of structural and design features. Personalized structural options frequently include cabinets, countertops, appliances and more for new homes. Buying homes with energy efficient features can be good for your wallet. New homes are built with improved insulation techniques, and tight construction which retains heat and cool air. With constantly evolving construction techniques, newly-built homes offer the latest and greatest heating and cooling systems, so you won’t need to worry about running your air conditioning for hours to stay cool. Newly-constructed homes also come with eco-friendly appliances, and water-conserving plumbing fixtures which will save you on monthly utility bills. How many times have you wanted to spend your free time playing your with kids but had to fix the broken sink? Older homes can have hidden costs in repairs and updates that are sometimes missed in the inspection. A new home, like buying a new car, comes with a peace of mind without the stress of constant maintenance — plus, you can finally get around to going for a family hike, or a day at the beach. New homes more often than not provide a warranty. These warranties can replace certain elements of a home like windows, heating and air conditioning systems, and ventilation if necessary. Another benefit along with a warranty includes the option to finance your personalized upgrades and a mortgage amount in the original purchase price. With older or existing homes, you’re on your own in obtaining a mortgage, and renovations will come out of your pocket. The Seattle real estate market is becoming more and more competitive. Making offers, and looking at several homes is never an easy process, and can bring unwanted stress into your life. Working with JayMarc will let you see the home-building process from start to finish, and saves the stress of house-hunting. Once your home is ready, the move in will be easy, without any immediate repairs or renovations. The more time you have with your family and your significant other, the happier you will be. Are you looking to build on your lot in Bellevue, Mercer Island, Seattle, or Kirkland? JayMarc’s custom homes program would be a perfect fit to help make your dream home become a reality. Call 425.615.6203 or email brenda@jaymarchomes.com. 28 Decorating Moves to Try This Month! Jennifer Ott from Houzz released a fun article voicing fun ideas you can do to spruce up your home for the Autumn season! From accessories to paint color, you can easily make your home feel cozy and warm with Fall tones. Many examples involved creating an accent wall in your bedroom with a rich red, brown or orange tone. If you are leaning toward using brown or orange, make sure your room gets plenty of natural light. Also, clean white and minimal accessories will make the room feel fresh. Traditional Bedroom by Boston Interior Designers & Decorators Gary McBournie Inc. In addition to paint, rugs with patterns can warm up your space especially if you have lots of wood or brick features in your home. Autumn colors also make for great accessory colors in neutral feeling rooms. These can be items like throw blankets, storage containers, bedding or even flowers. If you are feeling very adventurous, step out of your bedroom and spruce up main living areas such as the Kitchen or Dining Room. Autumn is about both bold and warm tones so don’t be afraid to mix it up. Jennifer recommended adding a pop of color to the Dining Room by adding colored chairs in a deep orange or in the Kitchen, painting the Nook walls a warm color. At the end of the article, Jennifer provides palette examples in deep reds, autumnal oranges and rich browns. Take a look for inspiration! What better way to start off the Autumn season with a well-organized closet!? It can be a pain to reorganize after putting away Summer clothes and replacing them with Fall/Winter attire. 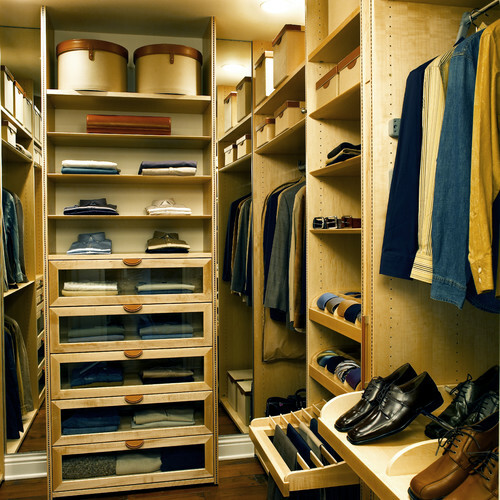 Zillow Digs has announced the top closet trends for 2015 and what you should ditch. Take a look and see how you can make what usually is a daunting task, a fun opportunity to start fresh! Transparent storage materials | Transparent storage materials such as frosted doors and see-through drawers will gain popularity among homeowners and in big-box stores this year. Split or his-and-hers finishes | Split closets with contrasting finishes and color palates will become all the rage, especially in bedrooms. Expect to see a rise in warm white paint tones and metallic accents contrasted with dark wood or leather finishes for a clean, but personalized, look. Spotlight lighting | Predicted to become the go-to closet lighting this year, directed lighting or spotlights are both functional and stylish. Spotlights also help create boutique-like ambiance that so many homeowners are gravitating to in their closet spaces. Behind-door storage | Hiding everything behind a small closed door is a thing of the past. Expect to see homeowners experimenting with large sliding doors and curtains, or even expanding closets into a larger space to better showcase and find their favorite items. Basic setups | Homeowners will want to go beyond the “closet in a box” arrangement and add their own custom touches or creative flair to organization spaces. Designers anticipate wire racking mixed with woven baskets or custom wood finishes to grow in popularity this year. Dark closets | Closets with minimal lighting or heavy doors that keep natural light out are quickly headed out of style. With the rise of transparent materials, homeowners will want an accessible closet where they can easily find belongings and enjoy how they’re displayed. To read more from Zillow Digs about closet trends, click here. This month, we are happy to introduce our Spotlight Contractor, Riverside Interiors! Riverside supplies several of our interior selections such as tile, countertops, hardwood flooring and carpet. JayMarc sat down with Chad, Co-owner of Riverside, to learn more about his role and the industry. How long have you been working for Riverside Interiors? I was hired by Riverside in 2002 as an installation subcontractor. I was very fortunate to land at such a great company. The owner, Mike, took me under his wing and taught me the importance of being a quality journeyman and taking pride in my work. Over the years we built a great relationship based on accountability and trust. In 2007 I became co-owner of Riverside and continue to work with Mike making sure we apply those same values to all our work. Explain a little more about what you do. During the recession we were all forced to wear multiple hats. I found myself doing a little of everything; polishing stone in our fabrication shop, conducting job site inspections, estimating, invoicing, etc. Now that things have picked up again I am trying to concentrate my focus on maintaining the quality of our work and managing all of the aspects of bidding and fulfilling all of our installation work with JayMarc. What is your favorite thing about your industry? I love to educate people on the materials they are choosing based off of my experience. Over the years I have seen which products succeed and which ones fail. I like to pass this on to the home buyers so they can make an educated commitment to the surfaces they are selecting. I find that people really appreciate having this information and that is helps them feel confident in their decision making. What is your favorite thing about working with JayMarc Homes? Working with JayMarc is great as we share common values. We appreciate their family style atmosphere and that they take the time to listen to their contractors and don’t just dismiss their concerns. I would definitely choose suckers. Not for myself, but to give to my two and four year old. When I give them a sucker it gives me a few moments of complete quiet so I can actually hear myself think! I love the outdoors. My absolute favorite thing to do in the Summer though is grab an inner tube and float down the Green River on a nice 90 degree day. Thank you Chad and Riverside for everything you do! We appreciate the hard work and detail you put into our homes. You truly provide the care for helping our homeowners love where they live!